Race/ethnicity of entire population (N = 3515). As subsequently shown by a more searching analysis, the composition of the applicant population has been changing steadily. Cohort analysis of race/ethnicity (N = 3185). Analysis of racial composition by year of birth cohorts also shows that the applicant population has reflected immigration trends. Highest Education Attainment over 25, Applicants compared to US Population (N = 936). In general, cannabis applicants compared favourably with national averages. Occupational divisions for employment for applicants and US population (N = 2092). The two groups are quite similar with the exception of Construction and Extraction, Office and Administrative Support, which are gender specific professions. Non-occupational divisions for applicants and US population (N = 494) The two groups are quite similar except for the relative scarcity of retirees in the applicant population. Distribution by year of birth cohorts (N = 3946). This further emphasizes that one's birth cohort determines what drugs one can try during adolescence. 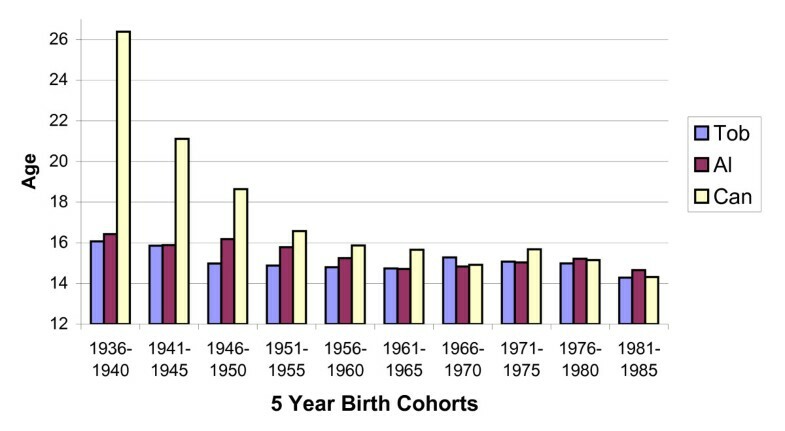 Birth cohorts and gender (N = 3906). Although women were outnumbered by men in each cohort, there were significant differences noted with age. Average initiation ages for entry level agents (N = 2498). This table is depicted by Figure 1 and emphasizes the rapid fall in age at initiation of cannabis after it first became available in high schools. Average initiation age tobacco, alcohol and cannabis. Those born before 1940 were fewest in number; they had also tried cannabis at the oldest average age. Baby Boomers born after 1946 were the first large cohort, and their successors were still younger when they tried cannabis. The 61–65 cohort initiated cannabis, alcohol, and tobacco at essentially the same average age. 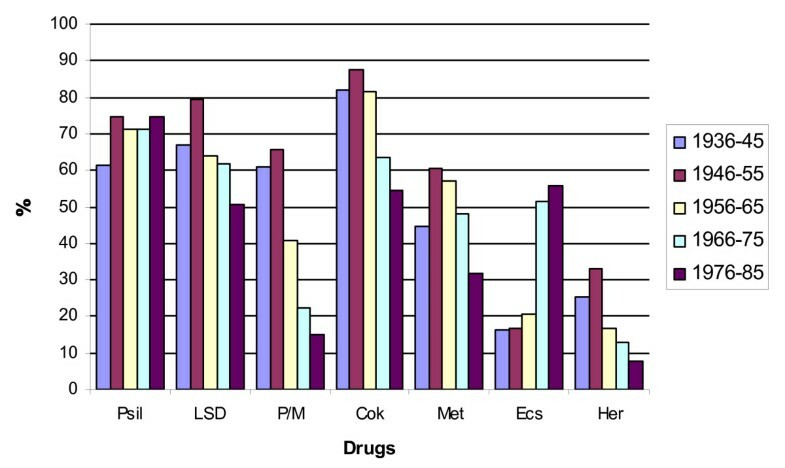 Initiation rates for other illegal drugs by YOB cohorts (N = 2364). With the exception of "magic mushrooms," and ecstasy (a psychedelic made illegal in 1988), initiation rates for all Schedule One drugs have declined since 1975. Initiations of other illegal drugs by race (N=2400). Although race seems related to initiation rates throughout, this shows that drug initiations by all aces trying cannabis have been falling proportionately as the adolescent market matured. Other illegal drugs tried by 10 year cohort analysis. Interestingly, while all cohorts sampled other illegal drugs aggressively during adolescence, the rates at which they've done so have fallen progressively. Note also the striking generational differences in peyote/mescaline initiations by older cohorts and ecstasy by younger ones. Initiations of Other Illegal Drugs by Gender (N=2464). Similarly, although women consistently tried all agents somewhat less often than men, the close parallels and internal consistency suggests the data are reliable. It has long been recognized that users of illegal drugs may be difficult to identify, let alone recruit into a study . That chronic users of cannabis would seek medical evaluations and be so willing to share sensitive personal information within the context of their required evaluations was the unanticipated benefit of Proposition 215 that made this study possible. Birth cohort analysis of the average ages at which applicants reported first trying alcohol, tobacco and cannabis (Table 8, Figure 1) demonstrates that a surge in youthful marijuana use began in the US in the mid Sixties. However, that event was not documented until publication of the first Monitoring the Future (MTF) data in 1975 demonstrated that over half of American adolescents were trying marijuana while still in High School . Close questioning of applicants suggests that the majority had been motivated by a mix of physical and emotional symptoms which had been experienced at varying times in their lives. Further, that a majority had become initiates, and later chronic users of cannabis under circumstances that suggest that it was for relief of emotional symptoms in most instances. Their discovery (usually later), that cannabis also relieved physical symptoms, was most frequently made within a context of established chronic use. That notion is further supported by recent literature indicating that phytocannabinoids, newly discovered endocannabinoids, and synthetic cannabinoid agonists all seem to manifest anxiolytic effects in both humans and animals [4–8]. A "gateway" hypothesis had developed from observations  that most marijuana users studied in the early Seventies were adolescents and young adults who had first tried alcohol and tobacco; also that many had tried marijuana before later trying heroin. However, subsequent efforts to establish a definitive causal link between marijuana and "harder" drugs have been largely unsuccessful . More recently, a theoretical alternative was shown to provide an explanation for accumulated MTF data that is at least as coherent .